To Cite: Wang H, Huang F. Babesia Infection in the Southwest of China, A Case Report, Jundishapur J Microbiol. 2014 ; 7(11):e13504. doi: 10.5812/jjm.13504. Introduction: Babesiosis is caused by apicomplexa parasites of the genus Babesia. Humans are commonly infected by Babesia through tick bites. There is limited information available about Babesia infection of humans in China. The aim of this study was to isolate the pathogen from a patient with severe parasitemia. Case Presentation: Blood samples were observed by transmission electron microscopy (TEM) and indirect fluorescent antibody (IFA), and red blood cells of bone marrow and blood smears were examined by a microscope. The patient was infected by Babesia and cured after a combined treatment. Conclusions: Babesia infection was detected in an individual from China. Babesiosis is a worldwide tick borne protozoan disease that infects humans and animals. Babesia is the intra-erythrocyte infectious agent of babesiosis. Humans are commonly infected by Babesia through tick bites (1). Babesia infected tick introduce sporozoites to the host and multiply in the blood as a clinical manifestation (2). Human to human transmission occurs through blood transfusions (3). Babesia is highly prevalent in malaria endemic countries, such as Africa, Asia, and South America (4), but rarely reported in Southeast China. In April 2010, a 46-year-old woman residing in Yunnan was hospitalized due to diarrhea, fever (37.3°C), chills, myalgia, fatigue, high leucocytes (18.40 × 109/L) and polymorphonuclear neutrophils (88.2%). The patient was reportedly bitten by ticks while traveling in Xishuangbanna where malaria was endemic. The study was approved by the patient and the Ethics Committee of Kunming General Hospital of Chengdu Military Region. Severe parasitemia was observed by microscopic examination of the erythrocytes in the bone marrow fluid with Wright stain (Figure 1 A, Nikon, E200). The morphology of Babesia was subsequently assessed by thin blood smears stained with Giemsa (Figure 1 B). For further identification of Babesia infection, blood samples were fixed, dehydrated, thin sectioned, and stained for transmission electron microscopy (TEM, Hitachi, H-9500, Japan) according to a previous study (5). Vacuolization of the host cytoplasm was observed by TEM (Figure 1 C, black arrow). To distinguish between Plasmodium falciparum and Babesia infection, indirect fluorescent antibody test (IFA) was performed using the Babesia microti IgG IFA kit (BMG-120, Gentaur, Belgium, at 1:256 dilutions) as the antigen to detect antibodies in the blood smears (Figure 1 D, black arrow). The detection of Babesia specific antibody by IFA is the most prominent tool for diagnosis, with specificity of 100% in patients with other tick borne diseases or those not exposed to the parasite (6). 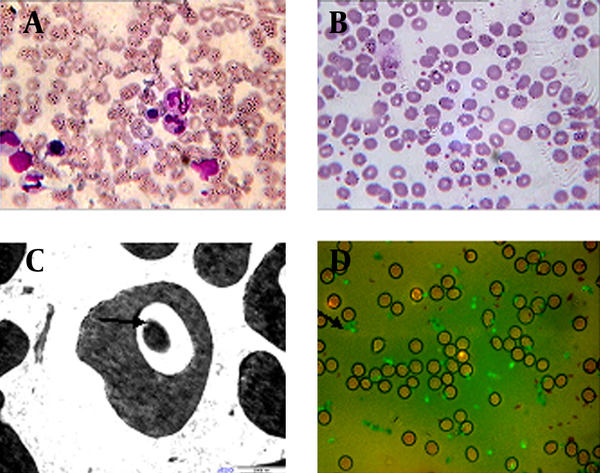 A. Parasites in red blood cells of the patient’s bone marrow (1000×), B. Babesia in the thin blood smear stained with Giemsa (1000×), C. Babesia observed in the blood by TEM (bar = 2 µm), D. Result of Babesia by IFA (1000×). The patient in the present study was cured by a combined treatment of artemether, azithromycin, and clindamucin through intramuscular injection and oral intake of atovaquone. Babesia is commonly reported to infect human beings with splenectomy (1, 7) or anemia (8). No lesions in the spleen or liver of the patient were observed by the CT scan. No indication of anemia was found. These results imply that immunodeficient patients, as well as those with low resistance, can be vulnerable to Babesia infection. We thank the doctors of Kunming General Hospital of Chengdu Military Region, who collected the samples. Authors’ Contributions: Huixuan Wang conducted the experiment, Fen Huang analyzed the data and wrote the manuscript. Funding/Support: This study was supported by the National High Technology Research and Development Program 863 (2006AA020902).